Why is it important for an organisation to have a systematic approach to quality management, e.g. supported by our Quality Management Tool? The simple answer is data. As long as an organisation's quality management is not based on verifiable data, it relies on opinions rather than facts. 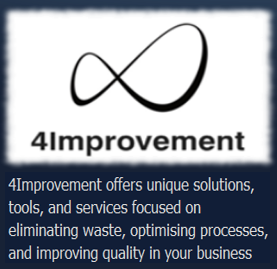 4Improvement provides real-time visibility into the performance of local or global operations and presents actionable information about product quality, volumes, yields, non-conformances, KPI's etc. in an easy to read visual format. Our Quality Management Tool is equally ideal for organisations that already implement TQM, QA, QC, QI or AQL. All of these concepts are fully supported by our software. During the initial deployment we configure our software to the particular needs of the organisation, and we also provide training for local system administrators and other key users. Our Quality Management Tool also adheres to ISO 9000, e.g. by providing for continuous supplier performance monitoring and subsequent data input to supplier assessment, evaluation, and re-evaluation according to ISO 9001:2015, section 7.4.1. The figure above illustrates the data flow: Quality data is entered via the user interface and stored in the quality database. The deployment interface presents graphs and visualisations based on data in the quality database. There are several data views for e.g. basic users, production planners, department managers, and executive staff. Both database and interfaces are updated in real time, i.e. there is no information delay or need for running batch jobs to update current status. The user interface of our Quality Management Tool has a number of mandatory fields in order to secure data consistency. As illustrated above, users cannot commit data to the quality database without entering valid data into these fields. In today's business world, most professionals associate quality management with the ISO 9000 series of standards or similar frameworks. See this Wikipedia article for further background information. Nevertheless, the industrialised world's currently most prominent quality management concepts have origins that are somewhat far from western world industrial standards and management philosophies. One critical concept in achieving the goals set by quality management system standards is to continually monitor and assess the various processes for their efficiency and performance. Nonconformances or opportunities for improvement may be noted during periodical quality audits, based on customer complaints or requests, or during every day manufacturing activities. Utilizing this information, the organization stands to gain significant performance advantages through improved organizational capabilities. If performed actively and vigilantly enough, it also warrants the manufacturer the opportunity to react proactively, shifting their focus from corrective actions to preventive actions. Modern quality management arguably owes much of its existence to the Japanese reindustrialisation after World War II. During the 1950s and early 1960s, quality control and quality management became main themes of Japanese business management. The Japanese economy was booming, and Japanese products, which had hitherto been perceived as cheap imitations, began to be recognised as innovative, reliable, and of consistent quality. Many of the ideas that are prominent in today's quality thinking around the world have their origins in the production and management philosophies developed in post-war Japan. Although the Japanese quality movement was heavily inspired by a handful of American mentors (Deming, Juran, et al. ), one could argue that Japan is the cradle of modern quality management. Many of the ideas, concepts, and methodologies invented/implemented by Japanese corporations during the 50s and 60s actually survive and thrive to this day. Anyone working in a manufacturing company has probably heard about Kaizen, Six Sigma, 5S, and similar concepts. These Japanese quality management principles gave rise to the development of a wide range of specific methods for e.g. problem solving, root cause analysis, and quality issue detection/prevention/countermeasures. As several of these methods are essential to our approach to quality management, the following paragraph is dedicated to the presentation of brief definitions of the key methods within this field. Before we can use the toolbox used in the Problem Solving methods (see some listed below), the need of data is essential to secure succes for pointing out the biggest issue for teams to work with. Please feel free to contact us, if you have any questions or if you would like a demonstration of our tool.